In 2014, four states and the District of Columbia legalized non-medical, retail marijuana for persons over 21. Although marijuana remains an illegal Schedule 1 drug under federal law, an estimated 35.1 million (13.2%) Americans aged 12 or older reported using marijuana in the past year. Who’s buying it? Approximately 18.5 million Americans aged 12 or older reported buying marijuana, which includes 1.8 million individuals aged 12–17 and 16.7 million persons aged 18 and older. Males and heavy marijuana users were more likely to buy. Six states (Mississippi, Kentucky, Massachusetts, Nevada, New Mexico, and Florida) had significantly higher percentages of individuals who reported buying marijuana compared to the national average. During the study period (2010–2014), none of these states had legalized retail sales of marijuana for non-medical use. As state-based marijuana legalization continues to evolve, it will be instructive to monitor recruitment of new marijuana buyers, particularly vulnerable populations such as youth. Every year, nearly 16 million American children see their mothers hit, kicked, or burned. Witnessing intimate partner violence (IPV) affects a child’s health, development, and academic performance. Children growing up with periods of homelessness or housing instability are at risk for many of these same injurious outcomes. Women experiencing IPV are four times more likely to experience housing instability or homelessness, placing children at double risk. The authors interviewed forty-two mothers who were IPV survivors enrolled in a Safe Housing program that provided emergency shelter, scattered site transitional housing, and flexible funding. Mothers were interviewed three times over a six-month period about their children's and their own safety and housing stability; 95% of participants were housed at the six-month interview when mothers described improvements in children’s stress levels, mood, and behavior. Mothers note the symbiotic relationship between their own stress and well-being and that of their children. Flexible funding to assist domestic violence survivors with their housing collaterally impacted the safety and achievement of two generations. A January 2018 article in Health Affairs reports findings from a study that set out to identify areas in the United States with high numbers of deaths among Medicare beneficiaries. The figure above depicts 2014 mortality rates from all causes for Medicare enrollees aged 65 or older by county. 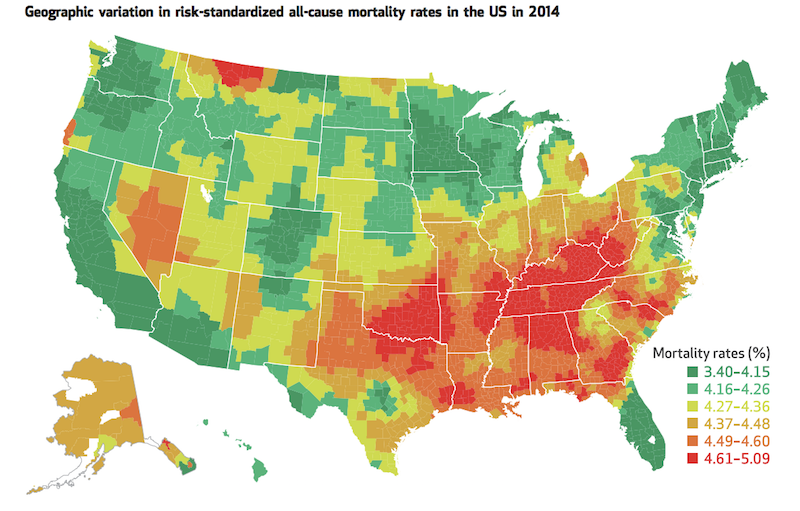 Marked red on the map, the highest mortality rates were found largely in the Midwest and South. Additional high mortality hot spots were identified in northern Montana, Nevada, and small pockets of Alaska, Oregon, and Utah. Similar regional trends were reported in 1999, though overall mortality rates declined from 1999 to 2014. Over fourteen million Medicare beneficiaries consider these 820 hotspot counties home. The study found that, compared to other areas in the country, these high priority areas have relatively more non-Hispanic White and Black residents with lower income and education levels, and higher unemployment rates. HEADER IMAGE: Napafloma-Photographe, At the end of the road? (detail). CC BY-NC-ND 2.0.